The ultimate course to guide you through what to play, what to practice and how to get better every day as a jazz pianist. Acclaimed pianist and educator Peter Martin gives you all the concepts, techniques and skills you need to take your jazz piano playing to the next level and beyond. This intermediate level course is perfect for aspiring jazz pianists looking for concrete guidance and specific techniques about what to play and how to practice in order to continually develop and grow as a player. It’s equally suited for the more advanced player looking for foundational practice techniques, fresh ideas and insights all clearly laid out and loaded with actionable practice items. 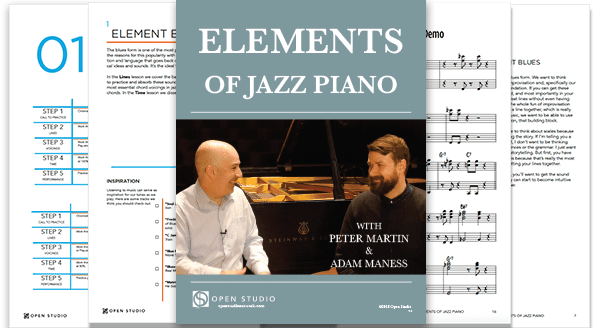 Elements of Jazz Piano features Play-Alongs for you to practice in a trio format with bass and drums, and even an opportunity to ‘trade’ bars with Peter! You can use these Play-Alongs to practice the tunes featured in the course as well as voicings, improvisation and even some creative technical exercises intended to take the monotony out of practicing scales. You’ll be inspired to expand and improve your jazz piano technique in new and exciting ways. Our Living Notation platform allows you to follow along with interactive transcriptions of the music and features speed control without losing pitch, A/B looping and multiple camera angles. All the lessons are shot in Ultra HD. The ability to adjust playback speed without losing pitch and to isolate any portion of the chart to automatically repeat, is a great way to learn at a pace that really works for you. There are lots of downloadable charts of tunes, voicings, scales and practice techniques to help you along the way and multiple viewing angles for you to simply watch – and imitate. Includes downloadable PDF of comprehensive 145-page workbook that is the perfect supplement to the course. Spiral bound version is available for purchase. This is the most practical jazz piano lesson/resource I have found on the web. Peter Martin’s artistry is nothing short of extraordinary. To sing with him is sublime – To listen to him play is a transcendent experience. An unbelievable musician with a unique kind of charisma. Not just the technical competence, but the deep kind of penetrating insight into music. Peter Martin is an acclaimed three-time Grammy® award winning jazz pianist, composer, arranger, and educator. His touring career has taken him to six continents numerous times. Peter performed on and arranged Dianne Reeves’ Grammy® winning release A Little Moonlight. He also appeared in the Oscar nominated film Good Night, and Good Luck and was the featured pianist and arranger on the Grammy® winning soundtrack. Peter has performed, toured, and recorded with Wynton Marsalis, Chris Botti, Betty Carter, Christian McBride, Joshua Redman and “Newport Now 60,” an all-star ensemble. Additionally, he has performed with the Berlin Philharmonic, the Chicago Symphony Orchestra, and the New York Philharmonic. Peter has performed at the White House twice for the President and guests. In 2014 Peter toured with “Newport Now 60,” an all-star ensemble that toured nationwide in celebration of the iconic festival’s 60th anniversary. Peter attended the Juilliard School of Music and is a former member of the faculty at Northwestern University. He has performed workshops and master classes at institutions worldwide, and has an ongoing intermediate to advanced online course, Peter Martin's Jazz Piano Method.